Arturo and Josefina are Spanish teddy bears that have a starring role in the PowerPoint presentations that feature in the Catherine Cheater Scheme of Work for Spanish Year 3 and Year 4. Both bears are a wonderful support in the Primary Spanish classroom. They enjoy participating in circle games, helping with greetings and farewells at the start and end of each lesson, and are particularly keen on teaching children in Year 3 how to spell their names. They very much enjoy being cuddled by the children! 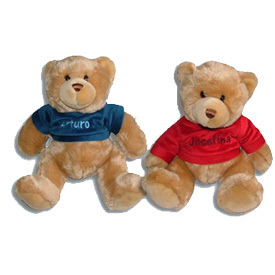 The teddies are 23cm tall and each comes with their own velour t-shirt, embroidered with their name. They are made from high-quality materials and can be sponge-cleaned as necessary. Their t-shirts can be removed for washing.